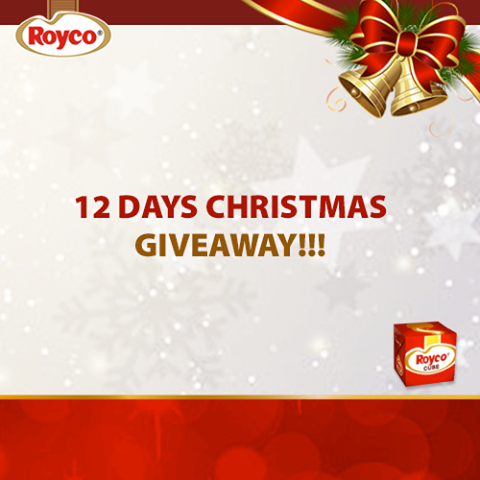 Good news Royco fam, Its 12 days Christmas giveway! Be among the first 5 to guess the right answers and win airtime from ROYCO. These general conditions apply to participation in the Royco 12 Days of Christmas Giveaway. By participating in this activity, the participant agrees to the following terms and conditions. 1. The Promoter is Unilever Nigeria Plc, 1 Billings Way, Oregun, Ikeja, Lagos. 2. The activity is administered through the Facebook platform but it is in no way endorsed or sponsored by Facebook. 3. The activity is open to everyone resident in Nigeria irrespective of race or tribe, who has ‘liked’ the Royco Nigeria Facebook Fan page. 4. It is recommended that anyone under the age of 18 years be fully assisted by his/her guardian, who approves of and consents to participation in the activity and the participant’s receipt/possession of the card. 5. The Promoter reserves the sole right to disqualify any entries that contain profanity, sexual content, abusive language or any other offensive content. 6. Participation in this offer is deemed as acceptance of these Terms and Conditions. By entering this Promotion each participant agrees to release, discharge and hold harmless Unilever, its legal representatives, affiliates, subsidiaries, agencies and their respective officers, directors, employees and agents from any damages whatsoever suffered or sustained in connection with this activity. 7. The activity runs from 14th December, 2016 and ends on 25th December, 2016. 8. Participants must correctly guess the answer to the questions asked on the Facebook page every day. 9. A total of 100 participants who answer correctly will win N500 recharge cards. 8 winners will be selected every day (4 on Facebook, 2 on Twitter and 2 on Instagram) with 12 winners on the final day (6 on Facebook, 3 on Twitter and 3 on Instagram). 10. Winners will be announced on the 26th of December in a post on the page. 11. Winners will be required to share their contact details with Royco via Facebook message. 12. The Promoter does not accept responsibility for lost, corrupted or delayed entries as a result of any network, hardware or software failure of any kind. 13. The Promoter reserves the right to verify the validity of entries, at any time during or after the activity, and reserves the right to disqualify any participant for tampering with the process, including but not limited to the use of techniques, for submitting an entry which is not in accordance with these Terms and Conditions. Failure of the Promoter to enforce any of its rights at any stage does not constitute a waiver of those rights. 14. If for any reason this activity is not capable of running as planned, including but not limited to technical failures, unauthorised intervention, fraud or any other cause beyond the control of the Promoter which corrupts or affects the administration, security, fairness, integrity or proper conduct of the activity, the Promoter reserves the right in its sole discretion to disqualify any individual who tampers with the entry process, and, to cancel, terminate, modify or suspend the activity. 15. The Promoter reserves the privilege to restructure and edit content in order to meet generally accepted grammatical standards and pass message across effectively. 16. The Promoter reserves right to store the details of participants for promotional purposes.